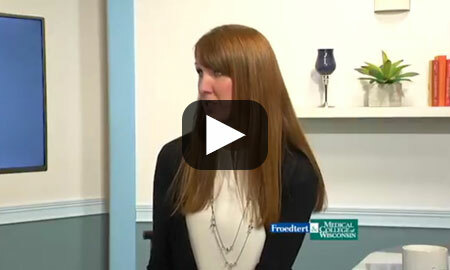 Fallon Schloemer, DO, neurologist, talks about what can trigger headaches and migraines and the different treatment options available. Headaches are a disruptive and painful problem. The pain may be unbearable, affecting your ability to work and conduct routine activities. Together in partnership with you, we will find the best solutions for your headaches. Most headaches are primary headaches. This type of headache is not due to a secondary issue, such as a tumor, circulation or an infection. Migraine, cluster and tension headaches fall into this category. Less than three percent of headaches are secondary, meaning they are due to underlying causes. Secondary headaches require testing to determine those causes. Chronic migraines are headaches occurring on 15 or more days per month for more than three months. Eight of those headaches in a month must meet the criteria for a typical migraine or be headaches that responded, even minimally, to migraine-specific medications. Your diagnosis may require a CT scan, MRI or brain wave test to look inside the brain for a cause. We may also perform blood tests to establish the safety of your treatment and to follow up on any abnormalities. As part of our multidisciplinary approach, we may consult with additional specialists. Treating migraine headache is a team effort. The Headache School is a program made up of 20 modules designed to help people with severe headaches be an active partner their plan of care. Below are some of the things you will learn about. Headache progression refers to headaches that worsen or change over time — a main reason people seek help. There are many factors that may cause progression. We partner with you to find factors that may be causing the changes, and through a complete treatment plan, work to reverse the progression. Finding these factors is not a quick or simple process. The greater the progression, the longer it may take to improve your response to treatment. Headache triggers include overuse of pain relievers, caffeine, migraine-specific medicines, poor sleep, obesity, depression, anxiety and stress. Stress requires special mention because it is such a common issue in daily life. The pain of headaches can itself be a stressor. Stress is as much a state of body as it is a state of mind. When stressed over long periods of time, the body responds by developing other problems and mental changes. While stress is common in daily life, we can suggest lifestyle changes to help you manage and reduce stress. These changes, along with medical treatments, may reduce the severity of headaches. Like other medical disorders, treating headaches involves observation, treatments, monitoring the outcome of the treatments, and making changes to improve your response. It is not a quick or simple process, but by working with our medical team, most patients can achieve positive results. While we have discovered a lot about what happens in the body to cause headaches and what adds to progression, there is still much to learn. Much depends on each person’s genetics, overall health and lifestyle. Finding the best treatment solutions requires you to "know yourself" by keeping a headache diary to determine what influences your headaches and how your treatments are working. We take a multidisciplinary team approach to examine the reasons for your headaches. Through medicine and lifestyle adjustments, we work with you to find the best answers. As we zero in on your headache triggers and the most effective treatments for each individual, it’s important to remember that there are no quick fixes. Headaches and their treatment can be complicated. Keep your expectations realistic. Even in the best of hands with the best of medicines, only half of the people with disabling headaches will reduce 50 percent of their headaches in six months with any given single preventative approach. Looking at all the angles, our multidisciplinary approach is an effective way to achieve positive results over time.